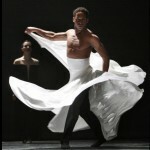 Roel Voorintholdt, the artistic director of the Dutch dance company Introdans, to handle its American debut at The Joyce Theater in 2012. I’d never heard of the company, nor did anyone I knew in the New York dance world. “Maybe you might be interested in the documentary film that was made about the company,” said Roel at the end of one of our first conversations. “It just aired in December on Dutch television.” “What is it about?” I asked. “It tells the story of the company through my love affair with Tom Wiggers, the founder of the Introdans, our eventual breakup, his forced retirement, what happened when I took over the company,” he replied. “I’ll send it to you.” Roel sounded slightly nonchalant, mentioning it as almost as an after thought. It arrived. I watched it, absolutely riveted by the frankness of the story and sensitivity of its telling, and then of course, I saw the story in it. I called Rebecca Milzoff, a writer whom I thought it would interest, and suggested a piece on the company using the film as the basis. The story appeared on the front page of The New York Times Arts section on April 30, 2012, the day before the company made its American debut at The Joyce Theater.